Cookatiel is the second boss of the Luncheon Kingdom in Super Mario Odyssey. It is a gigantic pink bird with a chef hat and ruffled white wings. Its name is a pun on "cook" and "cockatiel". It bears a resemblance to Wingo from Captain Toad: Treasure Tracker. It is first encountered when Mario tries to reach the stew pot at the top of Mount Volbono to collect a Multi Moon. Mario captures a giant steak at Meat Plateau and Cookatiel carries it up to the stew pot. After Mario collects the Multi Moon, a volcanic explosion blasts him off the mountain. It is encountered again when Mario captures a Lava Bubble and re-enters the stew pot. In battle, Cookatiel spits various fruits into the stew pot. It eventually gushes out pink liquid (either when Mario hit it from below, or after a while) that Mario can travel up while evading durians, and reaching Cookatiel will damage it. Cookatiel will then spit out more fruits in the second phase, and gush out the pink liquid in a zigzag fashion. In the third phase, Cookatiel will spit even more fruits, and gush out the pink liquid in small bursts. Once defeated, Cookatiel will fall into the stew and explode, revealing the Multi Moon. In the rematch in Peach's Castle, the fight is mostly the same, but there are now three Moonsnakes in the stew, which Mario must avoid. Cookatiel also makes an appearance in the level Cookatiel's Sizzling Sprint in the Nintendo 3DS and Nintendo Switch versions of Captain Toad: Treasure Tracker, where it chases Captain Toad throughout the level while spitting durians onto the course. 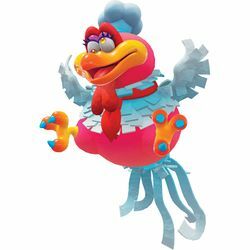 Cookatiel is a large bird, more specifically resembling a hen, dressed in chef's attire. Its natural body consists of hot pink skin with white, roughly square-shaped feathers that are arranged to look like a coat or shirt. Despite having the ability to fly, its wings are disproportionately small compared to its body, also covered in feathers. It has a curved, mostly yellow beak with an orange tip. The talons have two toes on the front and one on the back, following the previous color pattern along with having cyan nails. Hanging under the beak is a red wattle, a feature commonly associated with poultry. Similar material surrounds the eyes, and the eyelids are a different shade of pink than the skin with eyelashes and dark purple eyeliner. The eyes themselves are crossed, with the position of each pupil changing only as it moves, similar to googly eyes. Finally, the Cookatiel's tail has identical feathers to its torso but five select individuals are extremely elongated, simulating the sickle feathers of a rooster. The bird also wears a white chef's hat on its head and a red neckerchief around its neck; the exact same clothing of most Volbonans. Kokku-chō Cook Bird; a pun on 「コック長」 (head cook), which is pronounced identically. French Toque-toque Toque is a brimless hat, usually referring to a chef's hat. Also pun on "toc-toc" (crazy, cuckoo). Kukjo Cook bird. A translation of the Japanese name. This page was last edited on February 9, 2019, at 15:39.